Treat your skin and senses to the No. 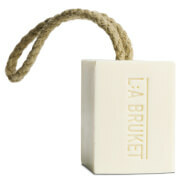 083 Soap on a Rope from L:A BRUKET, a Swedish brand that utilises natural and organic ingredients to cleanse, soften and hydrate. Harnessing the powers of Sage, Rosemary and Lavender Essential Oils, the handmade, delicately scented soap bar creates a luxe lather to gently eliminate impurities, whilst nourishing and moisturising skin to leave you feeling calm, comfortable and restored. Wrapped in rustic packaging and finished with a rope handle that is inserted during the pouring process. Elaeis Guineensis Oil (Smallscale Palm Oil), Cocos Nucifera Oil (Coconut Oil), Brassica Napus Seed Oil (Rapeseed Oil), Helianthus Annus Seed Oil (Sunflower Oil), Ricinus Communis Seed Oil (Castor Oil) and Linalool and Limonene (Both natural ingredients of essential oils).